The world of home cooking has never been more exciting that right now, thanks the various Siemens hobs available. Induction, gas, or electric; all options are accounted for giving you complete choice. 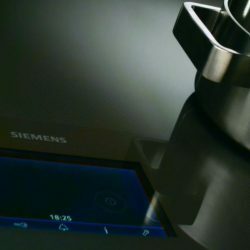 One of the most interesting features of the latest Siemens hobs is what they call flexInduction. The idea is that the cooking area is customisable to suite your style and the space available to you; for example you can either use a number of smaller induction elements, or combine them into one giant hob. To put it simply, you are put in full control of your kitchen. In the case of the studioLine hobs, this control is made even more granular with the addition of 48 micro inductors allowing you to place any pot or pan literally anywhere on the hob surface. Place something down, and the built-in LCD screen shows you a graphical representation; simply select a temperature and you’re good to go! Do a lot of cooking using woks? You’re in luck because Siemens offer wok burner additions to almost all of their hob options, which sit flush to the left or right. We’ve got one in this exact configuration at our London showroom, all wired up and fully usable. Come in and try it out some time! Staying on the theme of Asian cooking, another great accessory made especially for induction hobs would be the Teppan Yaki. This is a large flat “pan” used in Japanese cooking, which our customers tell us is also very good for quick healthy breakfasts. The entire surface heats up and is a superb alternative when preparing a stir-fry.